What Came First? Soy or Egg Allergy? Something wonderful happened the other day. I ate an egg for breakfast and I didn’t get sick. The next day, I ate another egg. Again, I didn’t get sick. This is a big event in this allergic foodie’s life. For over five years, I haven’t eaten eggs, or foods containing even the slightest amount of egg, because I’ll react with stomach pains and other unpleasant symptoms. Then a few weeks ago, while perusing Whole Foods, I came across Soy Free Organic Eggs from Chino Valley Ranchers. 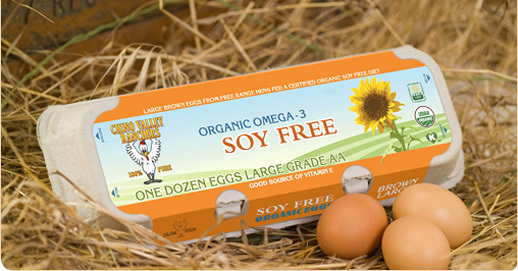 The gray and orange package read: LARGE BROWN EGGS FROM FREE RANGE HENS FED A CERTIFIED ORGANIC SOY FREE DIET. As I’ve mentioned in past blogs, soy is my worst allergen; I’ll react immediately and the horrible symptoms will last for days, sometimes weeks. It’s crossed my mind that it may not be the eggs making me ill, but rather the soy the hens ate and passed onto me, but I had no way of proving it. I’ve eaten the entire carton and not one symptom. Thrilled about eggs being back in my diet–Can you tell I’m really excited?–I called the family-owned company in Arcadia, California. David Will, the general manager, was appreciative to get the positive feedback. He said the soy-free eggs were a direct response to the company receiving so many calls from customers asking for eggs without soy. Proof that some companies actually listen to those of us with serious food allergies! Just go over to The Gluten-Free Dude’s blog to see how many companies don’t. David went on to say it took seven years for a nutritionist to come up with certified organic feed that could equal the nutritional values in soybeans. Then a third-party laboratory tested and verified that absolutely no soy or soy protein could be detected. The company website has lots of great info if you want to know more. I did find another company called Grass Fed Traditions that produce and test soy-free eggs (the chickens are fed coconut), but they are mail order only and prices are extremely high. If you know of another egg farmer that offers certified soy-free eggs, let me know. 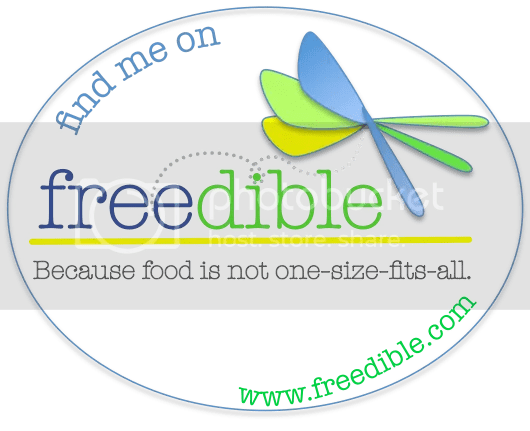 Explaining to David that I, along with most of my readers, have multiple food allergies and/or celiac disease, I asked specifically what the hen’s feed contained. About 50 to 60 percent is corn; corn is one of my allergies—a one on a scale of four–but I do not react to these eggs at all. I’d be curious to find out of if those of you with more serious corn allergies do react to eggs–these or others. The feed also contains field peas, sunflower meal, flax seed, alfalfa, along with grains and seeds. Of course, the mention of grains threw up a red flag. David assured me that although the eggs are not tested for gluten, the chickens only eat miniscule amounts of wheat, if any. As those of us with celiac disease know, eggs are considered gluten-free by the celiac disease medical experts, and many bloggers and gluten-free cookbook authors encourage us to include eggs in our GF diet. Of course, a reaction to eggs is possible if hens eat mainly a diet of wheat and barley, but this isn’t a concern with the chickens clucking around Chino Valley Ranchers. So eggs are back in my life, and I’m one happy allergic foodie. In fact, I’m thinking about making an omelet with green peppers and onions and mushrooms for dinner tonight. If it’s ever crossed your mind that maybe it’s your soy allergy making you react to eggs, try these soy-free eggs and let me know what you think. I’m sure the kind folks at Chino Valley Ranchers would like to know, too. Did you test positive for an egg allergy or just a soy allergy? I think my egg allergy was a one on an ALCAT but I was told people with dairy allergies and multiple allergies like me usually can’t tolerate eggs. They made me sick so I believed them. Did they say what the chickens are fed instead? I went through the same thing with beef and chicken only my allergy is corn, so once I switched to organic free range grass fed I was ok. I listed the feed ingredients in my post. 🙂 Primarily corn. 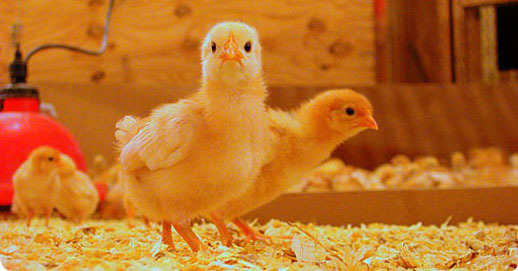 So you have found eggs from hens that only eat grass and nothing else? What brand?